The Citrix receiver received a corrupt ICA file the name (unauthorized”:true) is not allowed for a section. Here’s a couple things that I did to fix similar corrupt ICA messages that users would randomly get when launching apps and desktops. ◾Set the StoreFront or Netscaler Gateway URL as a trusted Site. ◾If using IE, add the URL to Compatibility Site list. ◾Clear Temp Files from Browsers. ◾Another option is to create a GPO or local policy and add the icaclient.adm or Receiver.admx template. 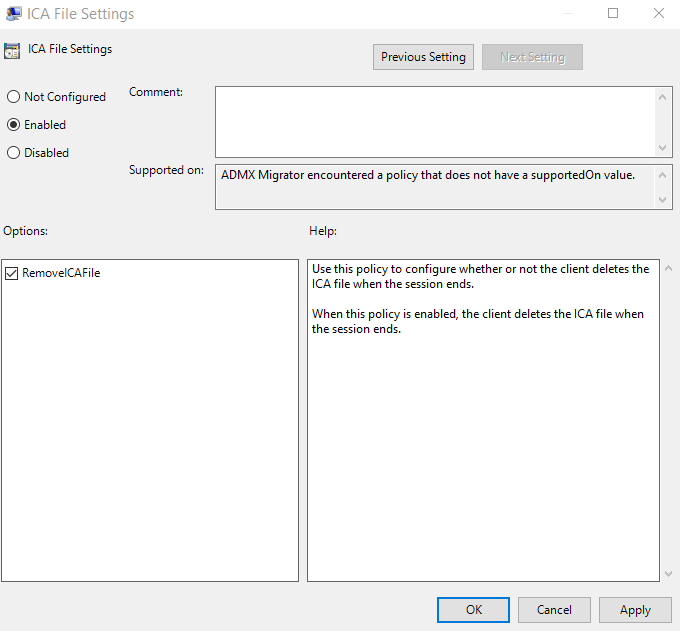 Configure ICA File Settings to delete the ICA file when the session ends. Navigate to Citrix Components > Citrix Receiver > Client Engine. Open ICA File Settings Policy. Click Enable, and Select RemoveICAFile. OK when Finished and close Group Policy Editor.